We were greeted by General Manager Robin Kemp when we arrived. We asked Kemp about the origin of the restaurant’s name, and when we heard the answer it made complete sense. The word “thoroughbred” is a term in horse racing, describing the purebred horses known for their agility, speed, and spirit. There is a pedigree associated with thoroughbreds, with the lineage tracing back to three original stallions. 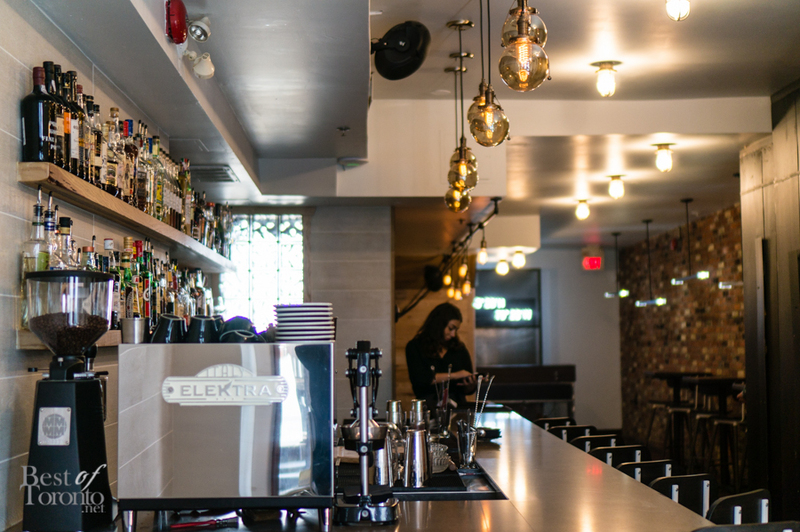 With Thoroughbred Food and Drink, co-owners Chef Ariel Coplan and Maître D’ Jacob Fox wanted to honour the pedigree of the restaurant industry, in assembling a top notch team to ensure the highest quality – in their food, drink, and service. We began our meal with a starter and bread course. The starter was a Mixed Grain Waldorf Salad. This is not your ordinary Waldorf salad that’s heavy in dressing; instead it was a very different take with its textures and flavours. 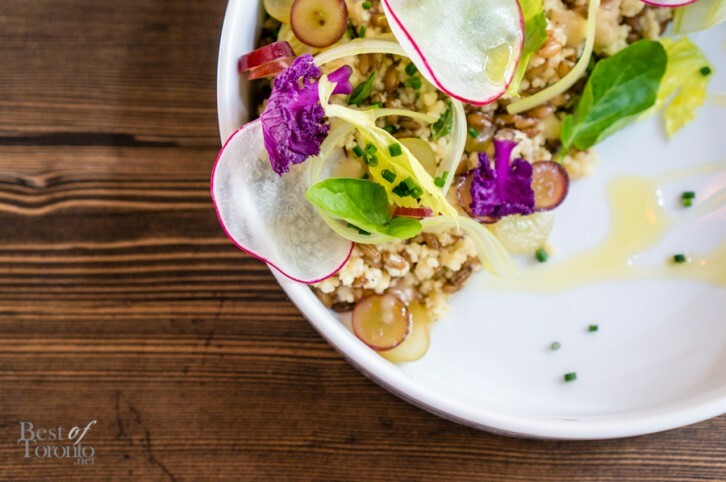 The sliced grapes, celery, and radishes, complemented the bed of grains and almonds, and the miso tied them all together beautifully. The salad was light and delicious. In contrast to this, our bread course – the Chicken Liver Mousse – was rich (and expectedly so), and even more delicious. The marbled rye bread was crispy yet still soft all the way through, which is exactly what you want as the accompaniment to the smooth and creamy mousse. The pickled cherries provided the tartness to cut through the richness of the mousse. This was an awesome dish, and my favourite. The mains were also amazing. The seasonal lake fish – a white bass this time – was expertly cooked, with its skin staying crispy and its meat remaining moist and tender. The smoked clams elevated the succotash to another level in both taste and texture, pairing very well with the bass. The B.L.T. was absolutely delicious. The “B” in this case is actually crispy pork jowl marinated overnight in char siu – a traditional Cantonese sauce for roasted meat. The pork was extremely succulent and flavourful. Roasted potatoes came with the sandwich, and they were done to perfection. Every dish we tried today definitely shone. With the meal, I had a glass of white – the 2012 Gewürztraminer ‘Frost’ Tawse from Twenty Mile Bench, Ontario. The wine list was chosen by Master Sommelier Bruce Wallner, one of only four master sommeliers in Canada. Nick had a glass of the Brickworks Cidery 1814. A selection of craft beers is also available, as well as coffee from Pilot Coffee Roasters. We dined at the downstairs level of restaurant, which is meant for more cocktails and casual eating. This is evident in the prominence of the bar, the high tables and chairs, and the cool, relaxed vibe given off by the decor. There’s a DJ booth in the back for live spinning. Upstairs on the second floor you get a more traditional dining experience. There you’ll find the open kitchen, and a chef’s table that can seat up to ten people and where family-style large format dishes are served. Kemp says the second floor will be open shortly (about two weeks at the time of our visit). The third floor offers a more private space, with a menu to be revealed. It’s also expected to open soon. While we only had a taste of the offerings from Thoroughbred, if it’s any indication of the rest of the menu, the other dishes will surely be just as impressive. I look forward to returning to sample Coplan’s other creations, especially the desserts, and some new items to come like the fried chicken, and the “Ain’t No Party Like an East Coast Party”, which promises to be a Canadian seafood extravaganza. The cocktail menu is also something I’m looking forward to discovering. Thoroughbred definitely lived up to its name, and with an amazing team driving it, it’s off to a great start. Thoroughbred Food and Drink is located at 304 Richmond St. W., just west of John St. It is open from Tuesday to Friday for lunch from 11:30 am to 2:30 pm, and from Tuesday to Saturday for dinner, from 5 pm to 2 am.